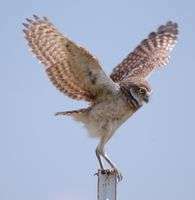 A burrowing owl lands on a post. (Phys.org) —It has long been known that birds and bats have small genomes, but the cause was uncertain. Now researchers at the University of New Mexico have shown that the genome shrinks over evolutionary time in species that spend lots of energy on flight. 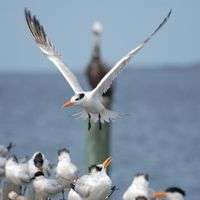 This discovery is described in a new paper titled, "Metabolic 'engines' of flight drive genome size reduction in birds," published in the Proceedings of the Royal Society B, by UNM Department of Biology graduate student Natalie Wright and Associate Professor Christopher Witt. "Natalie had realized that the size of a bird's flight muscles determines its capacity for producing bursts of energy, and energy use is hugely important in evolution" said Witt, who is the Curator of Birds at UNM's Museum of Southwestern Biology (MSB). "Comparing the flight muscles of different species provided us with a clever way to test the effects of energy use on the evolution of the genome. Fortunately, our museum here at UNM has bird specimens from all over the world that have been carefully preserved to allow this kind of study." Wright and Witt, along with their colleague Ryan Gregory at the University of Guelph, measured the genome sizes of more than 400 bird species from the MSB collection. They examined the sizes of the birds' bodies, flight muscles, hearts, and wings, as well as other characteristics. The muscles and hearts, more than any other characteristic, were linked to genome size. These organs are considered to be the metabolic 'engines' for avian flight. According to the work that Wright has done for her dissertation, the flight muscles can weigh up to one-third of a bird's body weight, and their bulk allows for intense bursts of energy production. The size of the heart sets the upper limit for sustained oxygen consumption because it limits the amount of blood that can be pumped with each beat. "This suggests that intense metabolic activity, such as occurs during flight, has caused the evolution of smaller genomes," said Witt. "The more energy that is required for flight, the more advantage there is to shedding extra DNA content that would otherwise slow down metabolism." The size of a bird’s flight muscles determines its capacity for producing bursts of energy, and energy use is hugely important in evolution say UNM ornithologists in new research. Wright elaborated on the likely mechanism, "If the lifestyle of a particular bird species requires energy-intensive flight, then that bird species is going to be subject to intense natural selection for efficiency of metabolism. Smaller cells are more efficient for transport of oxygen and fuel. A lot of people don't realize that DNA molecules are bulky—the more DNA an animal has, the larger its cells have to be." Does this mean that Olympic athletes might have smaller genomes than other humans in the general population? Wright and Witt refused to extrapolate beyond their bird data. "Ultimately," Witt said, "our data do imply that there are functional differences among individuals due to the amount of DNA in their cells. Natural selection on individuals has led to the observable differences among species, but these are very subtle differences with subtle effects on fitness operating over long stretches of time." In addition to showing that the energetic demands of flight are related to birds' smaller genomes, Wright and Witt examined how genome size has evolved across the evolutionary tree of birds. Hummingbirds have tiny genomes, as expected for birds that hover. The closest living relatives of hummingbirds, the swifts, also have small genomes, which makes sense because they fly nearly constantly to catch flying insects in midair. "This suggests that the common ancestor of hummingbirds and swifts evolved small genomes over 40 million years ago, and that natural selection has maintained those small genomes since that time," said Wright. "Other groups, such as the woodpeckers, toucans, honeyguides, and kingfishers, have large genomes. Those birds don't fly as fast, so maybe they can afford to be less efficient." With this kind of study Witt says, MSB is setting new standards for specimen-vouchered science. "We used 670 MSB specimens in the study, and we included a 22-page supplement with our paper that contains direct links to the online specimen records. By linking publications directly to specimens and their original data, we're making our science more robust, repeatable, and extendable," Witt said. Using the online database, Arctos, the MSB Bird and Mammal Divisions are leading the way in establishing these new standards. "We still don't know whether these genome size changes are caused by a few large mutations or by the accumulation of many small ones," said Witt. "Fortunately, because our research is based on MSB specimens, any scientist can try to answer that question by borrowing frozen tissue samples to sequence the very same genomes that we measured." And by leveraging this museum infrastructure at UNM, Wright and Witt have provided a clearer understanding of the causes of genome size variability. Total weight of the genome in the (human)body is roughly 1%. So shaving off a bit of DNA may actually be worth it in terms of less body weight to lug around when flying. But I'm not sure that I can follow the argument that a smaller genome automatically means a more efficient genome. It may be that a larger genome is more efficient, but that the additional bodyweight incurred is a bigger downside than the upside from the additional faculties encoded therein. I don't think the "weight" of the genome per se is the point here, antialias. What is more critical when one harbours longer genome is the expenditure of more energy in replicating such genome, an energy that can instead be used to power flight muscles. Also, as the authors point out, reducing DNA content makes cells smaller which facilitates faster metabolism. I know. I was just throwing out an idea that might have gone overlooked. Since flight is such a an energy intesive mode of motion any miniscule advantage could translate into a genetic shift in population. Even if such an advantage is only: 0.1% less bodyweight due to a smaller genome. "Well, given that we know the size of our genome (6*10^9 in diploid cells), we can work out the total weight per cell, which goes to 7.11*10^-15 kg of DNA per cell (from here). We will ignore mitochondria, as they are pretty much 100% coding, and vary in number per cell too much depending on the tissue. "An average estimate for cells in the human body is 10^14 eg. "Overall, this gives 7.11*10^-15 * 5*10^14 kg of DNA, or 0.7 Kg"
At 80kg for the normal human, our dna is less than 1% or less of our weight.